Glenn Miller : Big band charts from the Glenn Miller Orchestra. A range of big band arrangements made famous by Glenn Miller and his orchestra. Born Alton G Miller, he was a trombonist, composer and band leader who was America's best-selling recording artist from 1939 to 1943. His band is remembered for the "Miller sound", using four tightly-scored saxophones under a clarinet lead. He joined the army in 1942, formed the 50 piece Army Air Force band and famously disappeared on December 15, 1944 whilst flying from England to entertain the troops stationed in Paris. What are some of his famous charts that you'd know? His signature tune "Moonlight Serenade" began its life as an exercise in arranging, yet even now is instantly recognisable and still tugs at the heart strings. Miller's use of outstanding arrangers such Jerry Gray and Bill Finegan gave us "American Patrol" and "Little Brown Jug". 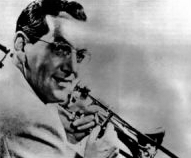 The Glenn Miller Orchestra had many other hits including "Tuxedo Junction"", "In the Mood" and "A String of Pearls". His vocal group, the "Modernaires", fronted by tenor player Tex Beneke" and vocalists such as Paula Kelly and Marion Hutton gave us such gems as "Chattanooga Choo Choo" and "Don't Sit Under the Apple Tree".